When you think of Bavaria, Munich is the first place that comes to mind. 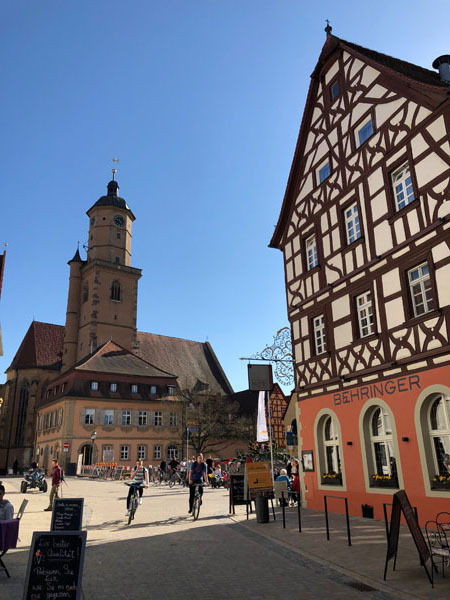 Beyond the capital city, the region of Franconia offers a bevy of charming towns, romantic vineyards, breweries, cultural and historical treasures and amazing culinary attractions that are waiting to be discovered. Situated in the center of Germany, this old kingdom was first discovered by the Roman Empire and remains intact as a cultural gem that is rich with history and natural beauty. For oeniphiles, start your journey in the medieval town of Volkach at the heart of the Franconian wine that is characterized by dreamy landscapes and 16thcentury stone homes. Over the last 1200 years, the region has been producing wine with over 80% of production consisting of white varietals and Silvaner being the most popular. The most notable characteristic of Franconian wines is their unusual flat shaped bottles called Bocksbeutel that are virtually unseen around the world and only available in this area. Explore the various vinotheques around the region to sample exquisite wines from a variety of wineries and learn about the different varietals and terroirs of the region. Stay at the charming art filled Hotel Vier Jahreszeiten, a former 17thcentury country castle in the historic center of Volkach to explore this breathtaking region and indulge in a gastronomic food and wine odyssey at their restaurant. 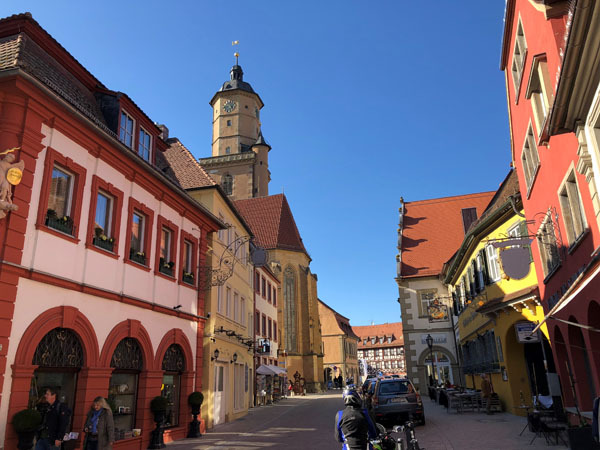 As you travel along the Romantic Road of Franconia, stop at the picturesque city of Wurzburg that is traversed by a river with medieval structures and rolling vineyards. The city is watched over by the prominent that houses the city’s cultural artifacts in the adjacent Museum fr Franken that houses a comprehensive collection of works by the medieval woodcarver Tilman Riemenschneider. Admire the beautiful panorama of the city from the Frstengarten on the edge of the fortress complex. If you happen to visit over the weekend be sure to enjoy the sunset and a glass of Silvaner on the Old Main bridge which connects the fortress to the Old Town- a favorite pastime of tourists and locals alike. The bridge dates back to 1473 and is lined with statues of important saints and notables who were important to Wurzburg. 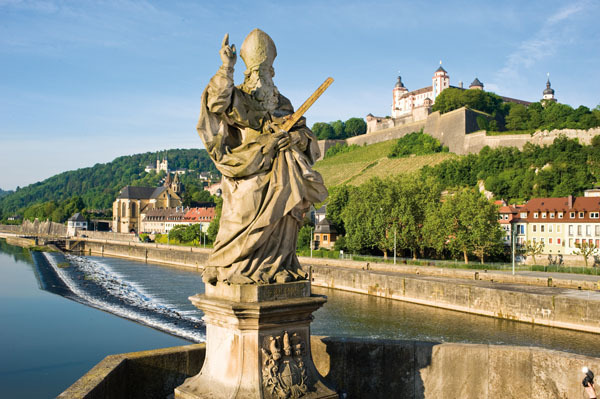 Most notable are the statues of the 3 Irish saints- Kilian, Kolonat, and Totan who brought Christianity to Franconia that came to Wurzburg in 680 AD and were subjected to a martyr’s death. To this day Kilian is considered to be the patron saint of Wurzburg. Take in the charm of the Old Town by meandering through the winding cobblestone streets and stop at the famous UNESCO World Heritage site- the Residence Palace. Once the former bishop’s palace this Baroque masterpiece was designed by Balthasar Neumann and incorporates the architecture of a French chateau edifice with a Viennese baroque interior and fresco ceilings inspired by the religious and secular architecture of Northern Italy. Afterwards visit the 16thcentury Weingut Statlicher Hofkeller wine cellar beneath the Residence Palace. This sprawling underground medieval cellar once housed all of the wine for the royal family and offers a unique atmosphere in which to appreciate and enjoy a variety of Franconian wines. To taste the authentic flavors of the region dine at the historic Wurzburger Ratskelker in the historic center of Wurzburg. Another local favorite is charming Backfele Restaurant that has been serving tradition Franconian dishes since 1580. 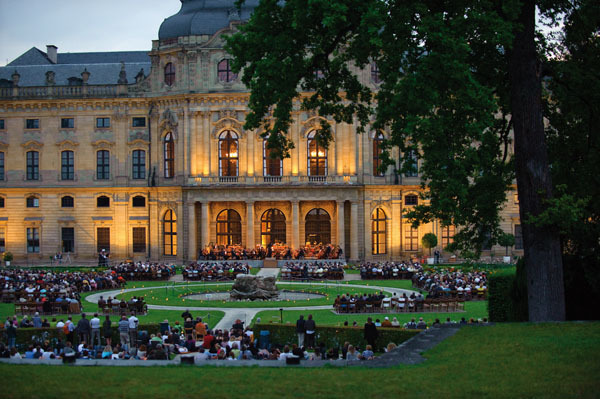 Though Bayreuth may be a small city with a population of approximately 70,000 residents, it makes up for its size with its music and cultural scene. The renaissance of the arts and cultural scene can be attributed to its most famous patron, Wilhelmina who brought world class musical performances to the city. 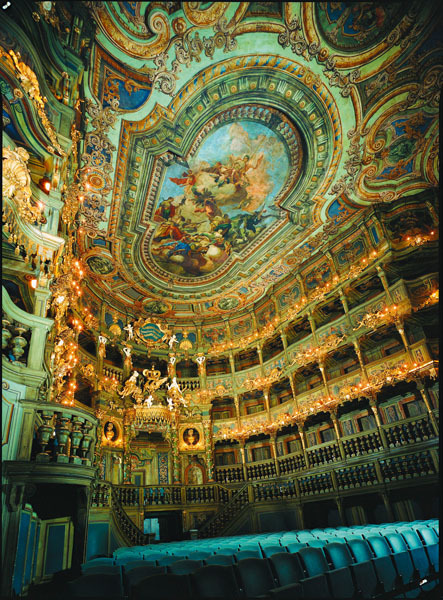 The most iconic landmark is the Baroque Margravial Opera House a UNESCO Heritage site which just reopened to the public after extensive renovations that restored it to its original glory. The town is characterized by its dreamy castles, romantic gardens, museums, music and theater festivals, that have attracted countless cultural luminaries. Bayreuth’s other famous resident was famed composer Richard Wagner. His former mansion, Wahnfried, has been converted to a museum that houses his masterpieces. Visitors can sense his inspiration in the regal living room which still houses his original grand piano. To understand the cultural development of Bayreuth is to experience the world of Margravine Wilhelmine, the favorite sister of Frederick the Great, and a true visionary from the 18thcentury. Her successes were not achieved in politics like other great women of her time, but in the intellectual and artistic world. She exemplified the Age of Enlightenment and in just two decades she and her husband Margrave Friedrich transformed Bayreuth into a cultural capital. Step back in time to the 18thcentury and walk in the footsteps of Wilhelmine as you visit her former lavish Baroque palace and explore the formal gardens. To understand the deep affinity for beauty that she and her husband shared, drive to the outskirts of Bayreuth to visit the lush gardens of her summer home, Ermitage. Stroll through the romantic rose gardens and fountains and walk through the thoughtfully decorated rooms of this gift from her husband which represented his adoration of Wilhelmine. Spend the day and have an alfresco lunch under the canopy of weeping trees at their café. As Bavaria is known for their beer, Bayreuth has some of the region’s top breweries. Misel’s Beer Adventure World was once a brewery but was converted to a comprehensive beer museum. Their comprehensive tour pays homage to the art of beer making and has one of the largest collections of beer collectibles, glasses and paraphernalia. Beer aficionados can try their flights as well as gastronomic pairings in the restaurant onsite. 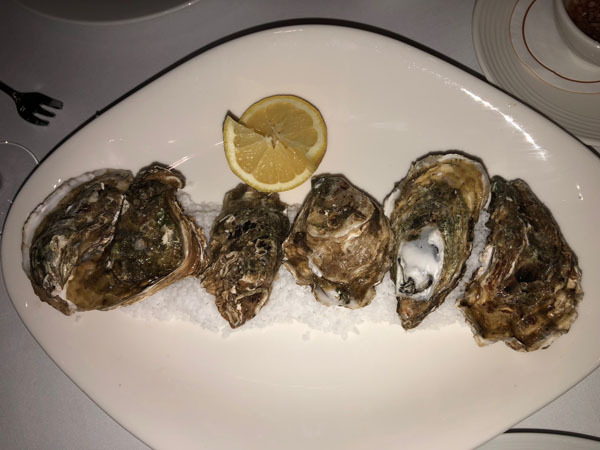 For those looking for traditional Bavarian fare that veers towards hearty meat dishes, dine at Restaurant Oskar in the middle of town. Conveniently located next door to the Opera House is the historic Victorian style Hotel Goldener Anker that has hosted many luminaries and celebrities over the last 250 years who came to visit. Each room has a unique and eclectic décor that reflects the history of this hotel that has been in the same family since the 16thcentury. 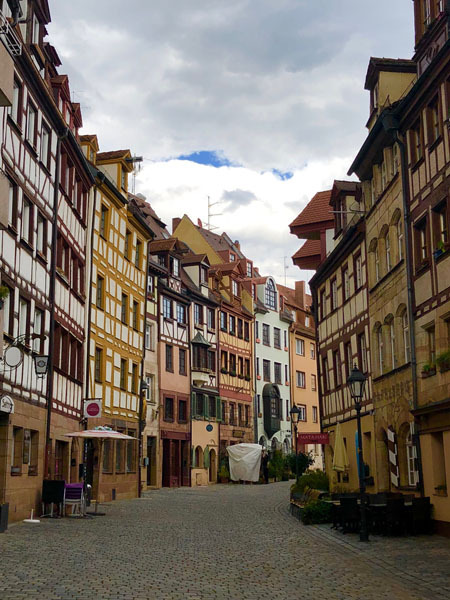 Though Nuremberg is known for its gingerbread, bratwurst and magical Christmas Market, it also has a dark side with their associations to the Nazi Party Rally Grounds and Nuremberg trials. But it is the mosaic of history that shapes this diverse city’s character in which we have to look to the past in order to avoid mistakes in the future. Though much of the city was destroyed in WWII, old and new architecture blend together bring the past into the present where Gothic cathedrals sit alongside historic buildings, outdoor cafes, and quaint boutiques. Visit the city’s medieval Imperial Castle, the churches of St. Lorenz and St. Sebald which were recreated and restored to their former appearance. Nuremberg also houses the city’s art bunker- a converted pickle factory that once protected the palace’s royal artwork and treasures during bomb raids. With the city’s historical legacy, Adolf Hitler chose Nuremberg as the center of its rallies and this was where the Nuremberg race laws were put into practice. While most of the city was destroyed in bomb raids in 1945 however the Palace of Justice remained intact. It was befitting that the Nuremberg Trials were held here with the fall of the Third Reich where Nazi war criminals were tried for crimes against humanity and peace. With its pivotal role in the history of National Socialism the National Party Rally Grounds the Documentation Center shows the city’s commitment to be a“Cityof Peace and Human Rights.” A required visit for German students, the permanent exhibit“Fascinationand Terror” shows the beginnings of the Nazi party, the propaganda and eventual fall of the Third Reich. This is important to show future generations about the causes, context and consequences of the criminal abuse of power during the National Socialist Dictatorship. 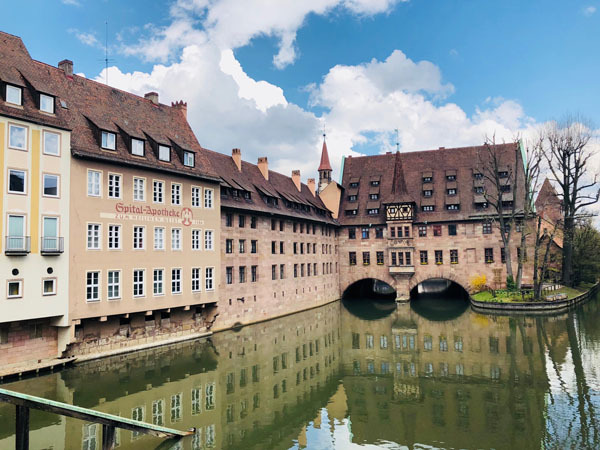 As the past intertwines with the future, Nuremberg remains a fascinating city in which to explore a rich trove of Bavarian history and culture in a beautiful setting. Food is a way of life here in Nuremberg. For a taste of old Bavaria, stop by the Craftman’s courtyard serving traditional Bavarian cuisine and timber homes filled with artisans selling handicrafts. Tour one of the city’s most popular breweries and whisky distillers at the Rock Cut Cellars that is located in the heart of the old town. Try their flight of beers that pair perfectly with Bavarian delicacies like the thinner Nuremberg bratwurst and sausage. Located in the trendy Gostenhof neighborhood is Hempels Burger restaurant that serves hearty overstuffed organic burgers with unique toppings that burst with flavor. Considered to be one of Germany’s best restaurants is Restaurant Sebald which fuses international and Mediterranean flavors with seasonal ingredients.